<!-Eric Gill. 1882-1940--> Eric Gill. Six Images. Initial 'S' with Church. 1916. Wood engraving. Physick 62. 1 x 1. 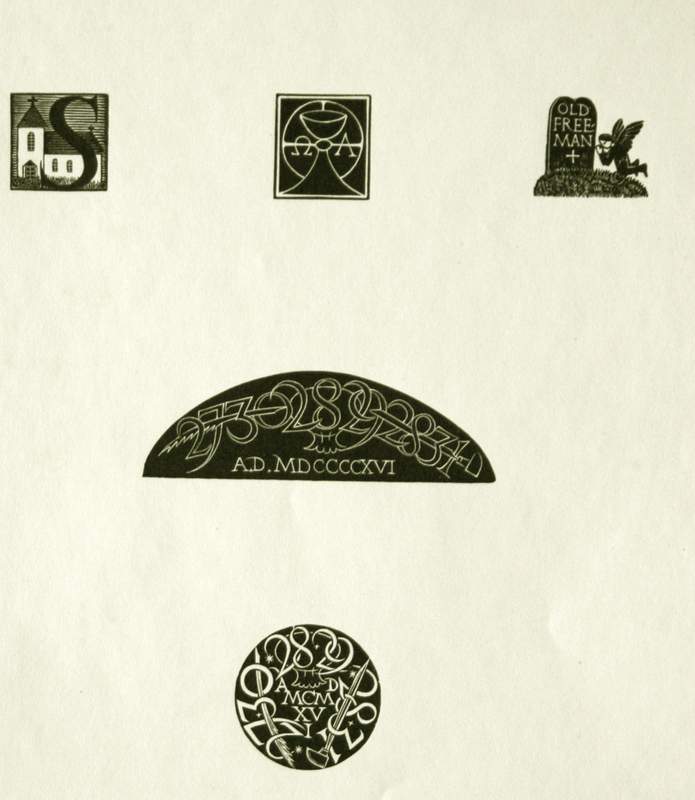 Engraved for S. Dominic's press. Device: Chalice and Host with O and A. 1916. Wood engraving. Physick 54. 1 x 1. Originally published in 'Serving at Mass', compiled by Eric Gill (s. Dominic's Press, 1916). Device: Gravestone with Angel: OLD / FREE- / MAN. 1916. Wood engraving. Physick 61. 1 1/4 x 1 1/4. Published in 'Old Free-man,' by Matthew Stephenson (Everard Meynell, London, 1916). Subsequently used in publications of S. Dominic's Press (e.g., in 'The Game,' II, I, January, 1918). Semi-circular Device: 273028292831 / A.D.MDCCCCXVI. 1916. Wood engraving. Physick 77. 1 1/8 x 3 5/8. Made for S. Dominic's Press, but wasn't used. Circular Device: 273028292831 / AD / MCM / XV / I. 1916. Wood engraving. Physick 78. 1 1/2 x 1 1/2. Originally published in 'The Game,' I, 2, December, 1916. A pen beneath '2730' refers to the work of Edward Johnston on pages 27 and 30; a printer's dabber beneath '2829' to H.D.C. Pepler's on pages 28 and 29; and a graver beneath '2831' to Eric Gill's on pages 28 and 31. 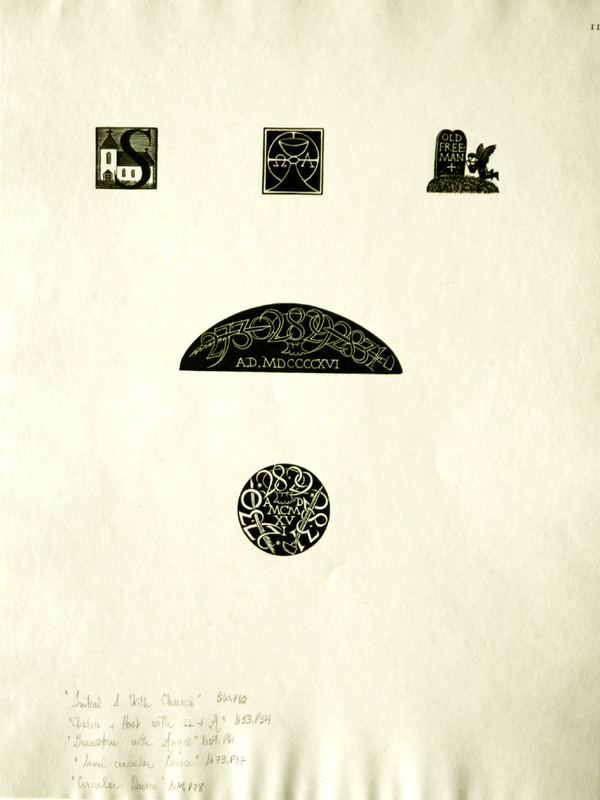 All five wood engravings printed upon the full sheet of cream wove paper (13 x 10). As published in Engravings by Eric Gill Douglas Cleverdon, Birmingham, England, 1929 in an edition of 480 on wove paper. Unsigned. $175.